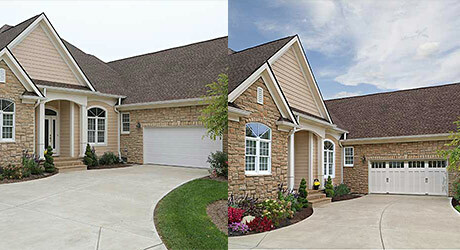 Your garage door is the most frequently-used entrance to your home and makes up a large portion on your home’s appearance, so replacing it can increase your home's curb appeal and value. Replacing your garage door was recently ranked as one of the top remodeling projects a homeowner can do to increase their home's value, with up to an 85% return on investment. 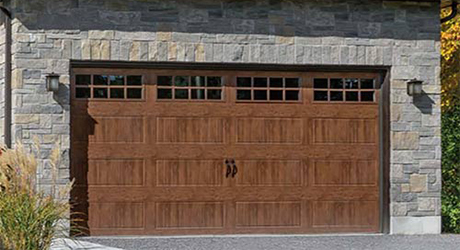 It’s important that when shopping for garage doors, you pick one that is both secure and stylish. This guide will walk you through the different garage door styles, insulation options, features and more. Garage doors are available in a wide variety of styles too match any home, but there are two main styles: the classic and the carriage house. 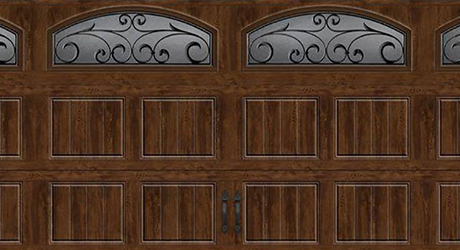 The five most popular garage door materials are wood, steel, aluminum, vinyl and fiberglass. Each has a number of advantages and disadvantages, so simply choose the best garage door material to fit your particular lifestyle and budget. If you prefer more customization, use our garage door configurator to design, visualize, and purchase your ideal garage door online. Choose from a variety of collections, designs, construction and insulation, color, windows, glass type, hardware, installation options and more. Upload a picture of your home to virtually see how your custom garage door would look once installed. Insulated garage doors are an excellent way to reduce your home's electric bills. The insulation helps block the outside temperature from entering your garage and prevents any heat or air conditioning from inside your home from needlessly leaking outside. Insulated garage doors are also a must if you utilize the garage as a workspace or bonus room where people often spend their time. Insulation can also help reduce the operating sounds of the garage door when in use. Insulated garage doors feature an insulated core surrounded by a cover. While polystyrene insulation and steel covers are typical (as seen in this picture), there are other material options. 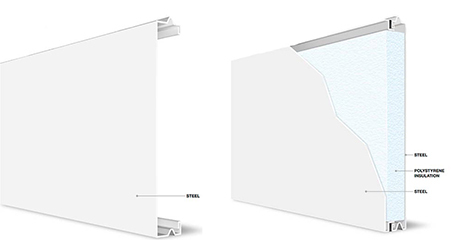 Many models of garage doors now offer different levels of insulation, which are rated by R-Values. The higher the R-value, the better the insulation. R-values specifically measure the insulation's ability to resist heat flow. If you are interested in insulating a garage door yourself, this video will walk you through everything you need to know. R-Value: 0.0 - Uninsulated doors, ideal for garages that don't need any temperature regulation at all. R-Value: 6.3 - Slight insulation, offering a minor protection from the outdoor elements. R-Value: 6.5- Slight insulation, offering a minor protection from the outdoor elements. R-Value: 12.9 - Offers sufficient insulation to protect your garage and helps retain heat and air conditioning. R-Value: 18.4 - Highest insulation value, will keep your garage temperature even with the rest of the house. 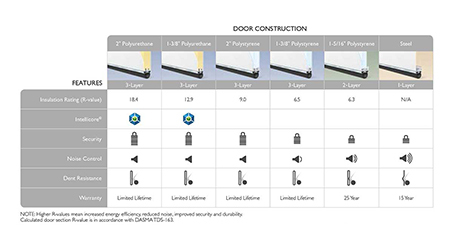 Different styles of door construction provide advantages in security, noise control and other feature benefits. Garage doors can be installed differently depending on the spring system you use. While installing your garage door can be a DIY project, we recommend leaving such a large task to the professionals. Learn about the Home Depot’s Installation Services here. Torsion springs are the standard springs used for residential garage doors and are able to support more weight than extension springs. They will typically use either one or two springs, depending on the door's weight, and are installed to a metal shaft above the garage door. Look for easy setting torsion springs that are similar to standard torsion springs but are much easier for the standard DIY-er to install as you do not need to manually wind the springs. Extension springs stretch to provide lifting power for the garage door. They are typically made of spring steel and designed to be mounted above the horizontal track of the garage door. Look for springs that have a safety cable to prevent injury in case of accidental breakage. Personalize your garage door to meet your family's needs by adding a garage door screen, windows, paint and more. The configuration of your garage door refers to whether you need a single- or double-door arrangement. 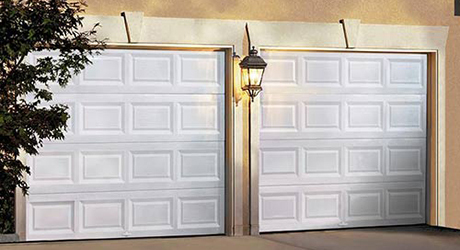 Install two single doors next to one another or one double door for a standard two-car garage. Paintable garage doors are plain white doors, typically steel panel construction, that cold hold paint well so that you can make it match the rest of your home. Windows add an elegant look to your garage door while allowing natural light to filter into the space. Hardware such as handles, deadbolt locks and decorative touches allow you to improve the security and look of your garage door at a low cost. Turn your garage into a screened-in porch with a garage door screen. Whether looking for prefabricated garage doors or having garage doors custom made, you will need to provide accurate numbers.